New York, June 24, 2010… Hundreds of Gilad Shalit supporters, including Israeli Ambassador to the United Nations Gabriela Shalev, Israel’s Consul General in New York Asaf Shariv, Rev and JM persona’s Gershon Veroba, Sandy Shmuely, Ron Eliran & Chaim Dovid. Michael Faulkner of New Horizon Church, joined the Conference of Presidents of Major American Jewish Organizations to sail the “True Freedom Flotilla” to raise awareness that Gilad Shalit remains in captivity, demand that his rights are respected and call for his immediate release. 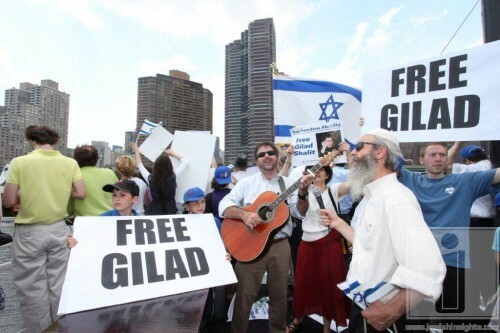 Friday, June 25th, marks the fourth anniversary of Gilad’s kidnapping and more than 1,450 days in which he has been held in total isolation, with no access to the International Red Cross or other humanitarian bodies. “Under the guise of a ‘freedom flotilla’ in the Middle East, organizations that have ties to terrorist groups have sought to create confrontations with the Israel Defense Forces. The real siege in Gaza is against Gilad Shalit. Since his capture, Hamas has provided only two indications that Gilad is still alive – a recorded message of his voice released on June 25, 2007, and a video of him released on October 2, 2009. According to international law, the Red Cross must be granted access to Gilad Shalit to ensure his well-being. However, no one from the international community has been allowed access to Gilad in order to ensure his welfare or that the conditions in which he is being held are according to international law. Just a week ago, officials from the International Committee of the Red Cross again were refused access to Gilad,” said Conference of Presidents Chair Alan Solow and Executive Vice Chair Malcolm Hoenlein. The Conference of Presidents also provided a humanitarian aid package including food, books, underwear, socks, a sweatshirt and glasses to Rosemary Mackey, a senior official representing the American Red Cross, to be transferred to Gilad. He has been held in total isolation, with no access to the International Red Cross or other humanitarian bodies, for more than 1,450 days. “Gilad Shalit must be released. Gilad was kidnapped across an international border on June 25, 2006, as part of an unprovoked and well-planned attack by the Palestinian militant group Hamas, which has been designated a terrorist organization by the United States and many of our allies, and has been kept in the manner that violates international law for more than 1,450 days. We have delivered a package of goods to the Red Cross in the hope that they can deliver them to Gilad, in accordance with the Geneva Conventions,” said Solow and Hoenlein. Two large boats and eight smaller boats participated in the Flotilla, which sailed from the west side of Manhattan, past the Statue of Liberty and around the tip of Manhattan, up the East River past the United Nations. Gilad Shalit supporters carried signs and waved flags to enthusiastic response from other boaters and people on shore.